It was a snowy day in Green Bay on December 1, 1985 as the Packers hosted the Tampa Bay Buccaneers. A foot of snow had already fallen by game time and it was accompanied by high winds that gusted to 40 mph and made for a wind chill of zero degrees. Neither team was in contention coming into the game. The Packers, coached for the second year by Forrest Gregg, had a 5-7 record, although they had won two of their last three contests. WR James Lofton was outstanding but QB Lynn Dickey was showing signs of wear. There was a fair group of running backs but, overall, the team was mediocre. Tampa Bay, under Head Coach Leeman Bennett, also won two of its last three, but had lost the nine games before that and was at 2-10. There was talent in workhorse RB James Wilder and promising new QB Steve Young, who had gained experience in the USFL and recently moved into the starting lineup, but the defense was a liability. Attendance was held to 19,856 at Lambeau Field due to the severe weather. The snow did not let up and the conditions didn’t improve during the course of the game, obliterating the yard markers and obscuring visibility. Green Bay won the toss but chose to kick. The Buccaneers thus had the first possession, ran the ball three times, and punted. Lynn Dickey completed a pass to James Lofton, but the star receiver fumbled after gaining 27 yards to midfield and LB Ervin Randle recovered for Tampa Bay. The Bucs were unable to generate offense and punted once again. Green Bay responded with a long drive that took up nearly the remainder of the first quarter. RB Eddie Lee Ivery and FB Jessie Clark carried the ball for the most part but Dickey completed passes to Lofton for 14 and 17 yards and to TE Ed West for 11. The advance finally stalled at the Tampa Bay eight and the Packers came up empty when Al Del Greco’s 25-yard field goal attempt was blocked. As the game proceeded into the second quarter, the Bucs again had to punt and the Packers put together a 61-yard possession in 11 plays that was helped along when, forced to punt, the Buccaneers were penalized for running into the kicker. Dickey completed passes to Lofton for 11 yards and WR Phillip Epps for seven to start the series and, following the penalty that kept the drive alive, he threw to Lofton for a pickup of 18 yards. Three plays later, and facing third-and-22, Dickey passed to TE Paul Coffman for 19 yards and shortly thereafter, unable to find an open receiver, kept the ball on a one-yard touchdown run. Del Greco added the extra point and the home team was ahead by 7-0. That remained the score at halftime as the teams traded punts for the remainder of the half. While Dickey was able to complete passes and the Packers generated 243 yards in the wintry conditions, the Bucs were held to 43 yards and one first down. RB Gerry Ellis returned the second half kickoff 40 yards and it took the Packers just four plays to score again. On second-and-12, Dickey connected with Coffman for a gain of 19 yards and, two plays after that, Ellis broke away for a 35-yard touchdown run. Del Greco again converted to put the home team up by 14-0. Following another punt by the Bucs, the Packers, starting with good field position at their 48, again drove into Tampa Bay territory, helped along by a pass interference penalty. However, they came up empty this time when Del Greco was wide to the left on a 24-yard field goal attempt. Another short series by the visitors concluded with another punt, and the teams exchanged turnovers in short order as FS Ivory Sully intercepted a Dickey pass at the goal line, CB Tim Lewis picked off a Steve Young throw two plays later, and Clark fumbled the ball back two plays after that. It appeared that the Bucs might finally get on the board when a long pass by Young intended for WR Kevin House on first down drew a 34-yard pass interference penalty on Lewis that put the ball at the Green Bay 30. Young completed a pass to House for 10 yards but the drive stalled at the 16 and Donald Igwebuike’s 33-yard field goal attempt to start the fourth quarter sailed wide to the left. The Packers responded by advancing 80 yards in nine plays. Ivery gained 11 yards on a draw play and Ellis had a 15-yard run. Dickey had four pass completions, two of them to Epps for 19 and 18 yards, and the second set up Clark’s three-yard touchdown run up the middle. Del Greco added the extra point and, with Tampa Bay unable to threaten for the remainder of the game, it capped Green Bay’s 21-0 win. The Packers completely dominated the Buccaneers, gaining far more yards (512 to 65) and first downs (31 to 5), and running 72 plays to Tampa Bay’s 36. Green Bay almost evenly distributed the yardage between running (232) and passing (280). The Packers were credited with five sacks, to two by the Bucs, but also turned the ball over four times, to one suffered by Tampa Bay. Lynn Dickey completed 22 of 36 passes for 299 yards, and while none were for touchdowns and two were intercepted, it was still a fine showing under the circumstances. Eddie Lee Ivery (pictured at right) and Gerry Ellis both gained over a hundred rushing yards, with Ivery accumulating 109 yards on 13 carries and Ellis contributing 101 on just 9 attempts that included a TD. James Lofton had 6 catches for 106 yards. For the Bucs, Steve Young was successful on just 8 of 17 throws for 53 yards with no TDs and one interception. He also led the club with 31 rushing yards on 7 carries. James Wilder was held to 23 yards on 12 attempts but led the team with 6 pass receptions for 33 yards. Green Bay lost the next week but won the last two games of the season to finish with an 8-8 record for the third straight year, which placed a distant second behind the Bears in the NFC Central. The Buccaneers lost their remaining games, including the rematch with the Packers in the more agreeable climate of Tampa, to end up last in the division at 2-14. 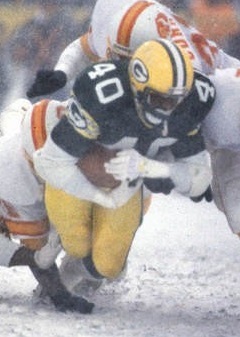 While the “Snow Bowl” had no impact on the race for the 1985 postseason, it has maintained a place in the lore regarding pro football games played in extreme weather conditions.